betoney had the most liked content! Currently Viewing Topic: What did you do to your FJ-tracer-gt today? @Exandriel Those are the required exhaust gaskets. Something is super sketchy with that exhaust and the method they used to mount it. If it was me I would replace it with something made for the bike that fits correctly. I'm wondering if it is even the correct model for this bike, if you look at Install videos for the FZ/MT09 the end silencer and mid pipe are one piece. Yes, I always replace them as a set. I got the same mileage out of the original Pilot Roads and PR2's. Currently using the Bridgestone S21 sport tires so will get significantly less miles. The tires are ridden on different pavement conditions, temperatures and locations, not just the typical wet Pacific Northwest. Before going to a flat drag bar, check your clearance with the bars at full lock left and right to see how close they are to the tank. @wanderer I use the X-Arc signals from High Tech Speed on both front and rear of my bike. They are small, durable (made of aluminum) and VERY bright. They also make the Proton Flush mounts if you want a slightly cleaner look. @nicksta43 Honestly, I didn’t notice much of a difference with the air deflector on the screen, not enough to keep it on the bike. It’s been sitting on my work bench for over a year. I may be the odd man out here but I have never heard a mechanical "clunk" when the forks rebound to full extension, and would be extremely concerned if I did. The only time I ever remember hearing that in 45 years of riding was on a 60cc bike when I was a kid, the forks were very low on oil. @nicksta43 Just the other day I was riding beside a car in town, she started to change lanes right into me, I laid on the horn for several seconds as her rear tire almost hit my front tire and she quickly pulled back into her lane. I have the Sound Bomb mini and it sounds just like a car horn and definitely gets their attention. I usually get the same error message as well. I have to lower the quality of the photo in the phone or send it to my PC where I resize it in Windows before posting it. You like the looks of the new GT II? I think they ruined the looks, especially the front. Oh well, it’s just a tire. The Angel GT's are FANTASTIC tires, I have worn out many sets on different bikes. The only reason I switched from Pirelli to my current Bridgestones is cost. 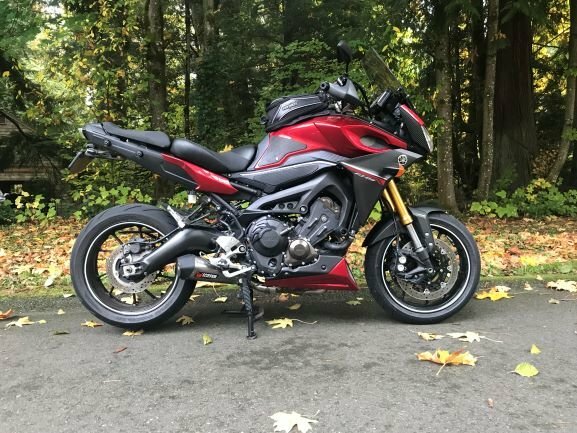 With a mixture of longer road trips and aggressive sporty riding, I average about 9,000 miles from a set of GT's, if you ride more conservatively then expect quite a bit more mileage. @tktplz - That is a great video, thank you for sharing it. Its kind of like counter steering, - its not something I think about or make a decision to do, its just like an instinct while I ride. I definitely set corner speed by braking up to, and then accelerating through the corner, so I guess "trail braking" is the method I use. And just like in the video, I control the radius with the throttle, accelerate to widen and roll off to tighten the arc. Agreed, - if you want to keep the bags mounted AND have the indicators actually be seen then your only option will be to keep them out back behind the bags, at or near the stock position.